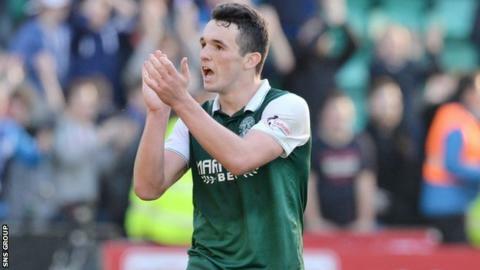 Midfielder John McGinn is confident in-form Hibernian can keep up their Championship title challenge. The Easter Road side are five points behind leaders Rangers and on a run of 12 wins and a draw in all competitions. "We've put a marker down with our form and proved we have the ability to beat any title rivals," said McGinn. "We just need to focus on performing the way we have been and if we keep on doing that we'll be in with a real chance." McGinn joined the Edinburgh team over the summer, having been with St Mirren since his childhood, with the 21-year-old delivering a series of stand-out performances. And he attributes strong competition for places as a factor driving him and his team-mates on. "Rangers might argue that they have better players, which I'll disagree with because I'm biased," he told BBC Radio Scotland's Sportsound. "We've got two or three players for just about every position that can come in and do similar jobs. "We know we have to perform on the Saturday because if we don't we'll be out of the team. That has really pushed us on this season." McGinn will play his 20th match of the season when he captains Scotland Under-21s against Ukraine on Friday evening. "I've not had a rest so far this season and it's something I'm not complaining about," he said, explaining that maintaining regular first-team football was a key part of his decision to join Hibs. "That's why I waited," he continued. "I waited an awful lot of time. It was important for myself that it was the right move. "I spoke to a few managers but I knew right away when I spoke to Alan Stubbs that I was going to be given the opportunity to play, and play in a style that would suit me. I think my decision has proven to be the right one. "I feel he is getting the best out of me and playing games is really important for someone my age. "I think I've matured on the pitch. I'm getting stronger and faster and cutting out the silly mistakes I'd been making in the past couple of years. That's credit to the manager at Hibs. He is really good to work under, he gives you a lot of freedom to play and I have thrived on that."